"I love winter squash, but tend to hate the effort of getting into them. Your ... read full review"
Squash: The fruits of various members of the gourd family, which fall into two classifications, summer squash and winter squash. Winter Squash have thick skin, a hollow inner cavity containing hard seeds, and very dense flesh requiring a longer cooking time than summer squash. The skin on winter squash is not edible and the squash must be cooked before eaten. They are picked when fully ripe, unlike summer squash that are picked before fully ripe. Winter squash are drier and have a sweeter taste than summer squash. The skin on winter squash is hard and must be removed before eating the squash. They are low in sodium, a good source of vitamin A, and high in fiber. Examples of winter squash are butternut, buttercup, turban, acorn, and spaghetti. Winter squash are often cooked and eaten on their own simply with salt and butter added. They also go well with other seasonings, such as cinnamon, ginger, cloves, and allspice. Some winter squash are sweetened by adding brown sugar, maple syrup, and honey. Winter squash can be added to soups, stews, curries, casseroles, and other dishes. They can be mixed with other vegetables and be used to replace sweet potatoes in most recipes. 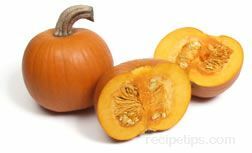 Winter squash are also used in pies, muffins, cakes, puddings, and other desserts. Select squash that have dull-colored skin, firm shells, and are heavy for their size. Smooth, shiny skin is an indication that the squash is not ripe. Avoid squash with damaged spots or that are cracked. If purchasing a cut squash, select a piece with darker flesh, which is an indication that it is nicely ripened. Winter squash are available all year round but their peak season is early fall to early winter. Most varieties of winter squash can be stored for several months if kept in a cool, dry, dark location. If exposed to temperatures below 50°F, they will suffer damage, and if it exposed to excessive heat, the squash will begin to convert their starches to quickly. It is best to store the squash with part of the stem still attached to help hold the moisture in and they should not be wrapped when stored, unless they have been cut open. Then they should be wrapped in plastic and stored in the refrigerator for 4 to 5 days. A cooked squash can be stored in an airtight container in the refrigerator for 4 to 5 days or it can be placed in the freezer for longer storage. A type of winter squash resembling an acorn in shape and typically measuring up to six inches in length. Acorn squash can be found in varieties with coloring of dark green, white and gold. The most common variety has a dark green ridged outer skin and a deep yellow to orange flesh. 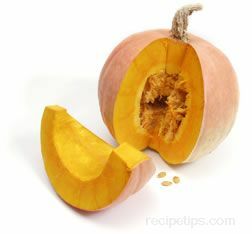 The Golden variety has a pumpkin orange colored skin with the traditional orange inner flesh. They are delicious when baked with brown sugar, honey, and butter, providing a sweet and somewhat nutty flavor. Smaller individual squash are also commonly served whole, stuffed with ingredients such as sausage, bread, vegetables, and seasonings that may have been baked once and then again inside the squash so it is served as a "stuffed squash". Banana Squash A long oblong-shaped squash with a tan or cream-colored thick outer skin and a golden fine textured inner flesh. Size may range from 2 to 3 feet in length, so the squash is most often sold as quartered sections in food stores. The squash can be baked, pureed, or steamed to be served as a side dish seasoned with butter and herbs, or used as a base for soups and stews. This squash is available year round, but best during the months of August to October. A winter squash, typically weighing 5 to 7 pounds, that is round in shape and grows with a very distinctive protruding ring around the flower end opposite the stem end. Dark green with narrow grey stripes, the thin outer skin surrounds a rich, sweet-flavored, somewhat nutty tasting orange flesh that is fine-grained, creamy textured and dense in consistency. This squash can be stuffed, baked or microwaved to be served in soups, casseroles, pumpkin pie or as a side dish. When stored in a cool dry area it can be kept for months if not opened. A long, pear-shaped squash with a tan skin and orange, sweetly flavored flesh. It is one of the most popular winter squashes and is also known as the pumpkin squash. A round pear-shaped squash that is found in a variety of sizes ranging from a few inches in diameter, similar to a small canteloupe up to two feet. The skin color ranges from green to light tan or orange and covers a firm golden orange flesh, slightly firmer than the flesh of a pumpkin. With a sweet mild flavor, this squash can be prepared just like other squashes such as acorn and butternut. It is a good substitution in recipes requiring pumpkin or butternut squash. The Calabaza squash is native to Central and South America as well as the Caribbean. It is also known as the West Indian pumpkin, the green pumpkin squash, calabash, and calabasa. A small to medium sized squash ranging in diameter from 5 to 7 inches. Round and hard skinned, the inner, somewhat stringy flesh has a mellow, but sweet flavor similar to sweet potatoes. This squash can be baked, pureed, or steamed to be served as a side dish seasoned with butter and herbs, or used as a base for soups and stews. A variety of Asian squash that is popular in China and Japan, as well as many other countries. It is typically a larger variety squash that has a waxy dark green speckled skin that contains tiny prickly hairs. The outer skin covers a white firm inner flesh. This vegetable is widely grown to be eaten raw or as a cooked and roasted vegetable. 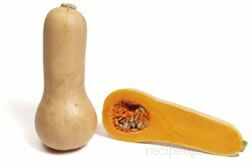 The ends of this squash are commonly hollowed out to be used as a bowl to be filled with chicken soup or other types of soup. 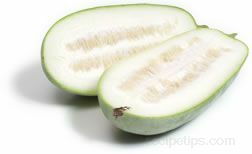 Other names for this vegetable include: ash pumpkin, beligo, bi bee, bi dao, Chinese preserving melon, Chinese wax gourd, Chinese winter gourd, dong gwa, dong gua, jit kua, koondoor, kundur, mo-kuey, large fuzzy melon, tallow gourd, tang-kuey, tohgan, tougan, wax gourd, winter gourd, and zucca della cera. A long oblong-shaped squash with a cream colored, green striped thick outer skin and a golden fine-textured inner flesh. Size may range from 5 to 10 inches in length. The squash can be baked or steamed and served as a side dish seasoned with butter and herbs. When preparing in an oven, cut the squash in half by cutting down the length of the oblong shape. Place the squash with the skin side down in a dish with 1/2 inch of water. 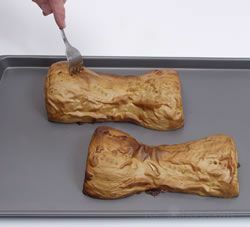 Cover the dish and bake for 1/2 to 3/4 hour at 375 degrees. In a microwave, cook for approximately 20 minutes in a dish with a loose cover of plastic wrap. This squash is available year round, but best during August to October. A variety of winter squash, which is sometimes referred to as an Oriental pumpkin that has the appearance of a small pumpkin in shape and color. It ranges in size from one to three pounds. The outer flesh is thick and as the squash matures, it changes from a glossy orange to a duller orange appearance, which indicates that it is ready to harvest. The meat inside is pale yellow in color and limited in volume, but it provides a flavorful meal when cooked. 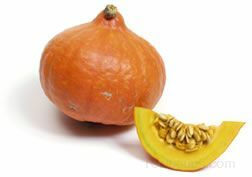 An early winter squash that combines a sweet dumpling with an acorn squash to produce a small acorn shaped vegetable. The outer skin is cream colored with dark green stripes covering a fine-grained inner flesh that is orange when ripe. This squash has a sweet rich flavor and can be baked, mashed or steamed. Store in a cool dry place for up to 6 months. 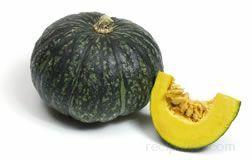 A winter squash with a thick bumpy skin that may range in color from grayish-blue (Baby-blue and blue hubbard) to green (Green hubbard) to bright orange (Golden hubbard). The Baby-blue hubbard is a small squash while the Green, Blue and Golden are large in size. The yellow fine-grained flesh has the best flavor when it is baked or boiled and then mashed with butter, herbs, and spices or brown sugar to enhance the flavor of a variety that may be typically bland tasting. The squash can be served as a side dish, used as a base for soups and purees, or made into pumpkin pie filling. It can be stored for long periods if it is kept in a cool place. Iran Winter Squash An older variety of winter squash, which is grown from heirloom seeds. It is not commonly found, since it is grown from heirloom seeds. Large and pumpkin-like in appearance with a round shape and flat outer ribs, this squash will grow to a weight of 20 to 25 pounds at maturity. The outer skin may be green, salmon-orange, or white in color, while the meat is pale orange and somewhat dense in texture. Iran squash can be prepared in the same manner as other winter squash. A pumpkin shaped winter squash. It has a rich, sweet flavor and when cooked its texture resembles that of a tender potato. Kabocha squash weighs an average of three pounds and has spotted or blotchy dark green skin. It can be baked, steamed, stuffed or pureed. Works well as a substitution in recipes that call for pumpkin or sweet potatoes. Kabocha is generally available all year round. Orangetti Squash An oblong-shaped squash that is a variety of the spaghetti squash. It has a tan to yellow thick-skinned outer shell with a tapered oval shape. Inside the hard outer skin there is a fibrous flesh that provides a very delicate and mellow flavor. This squash can be baked or boiled until the flesh is soft for the strands to be removed. It can be served as a side dish, as part of a casserole, or mixed into a salad. When served similar to pasta, it can be complemented with a buttered sauce and served hot or cold. Orangetti squash is available from August to October. A winter squash with orange skin and flesh. Their size can range from very small to very large, close to 1000 lbs. The larger pumpkins are generally grown only for size and are not used as a food. The sweet flesh of the pumpkin is used in baking, often pies, but is also used in puddings, soups, savory dishes and stuffing. In the United States the pumpkin is popular to use for ornamental purposes, such as jack-o'-lanterns for Halloween. They are generally available in late September through October. Canned pumpkin puree is also available in grocery stores or can be made from fresh pumpkin. A short, stout pumpkin squash that is a true field pumpkin and an heirloom variety of squash native to France. Known also as a Potiron rouge vi d'Etampes, a Rouge D'Etampes or a Cinderella pumpkin, this squash is used as both an edible and an ornamental squash. The traditional Red Etampes has a smoother outer skin, reddish-orange in color with some irregular bumps on the surface. The squash may be fully matured with a full orange coloring or have an orange background with green strips running up the ribs. Inside there is a meaty deep yellow flesh, firm in texture which is somewhat bland tasting. The Red Etampes is a good squash to combine with other foods or its taste should be enhanced with other flavors, such as brown sugar and butter. A thick-skinned orange colored squash that has the appearance of an oblong pumpkin without the ridges. Inside the hard outer skin there is a firm flesh that provides a very delicate and mellow flavor similar to the taste of chestnuts. This squash is available year round and can be baked, braised, pureed, or steamed to be served as a side dish or used as a base for soups. Also known as Orange Hokkaido or Uchiki Kuri squash. 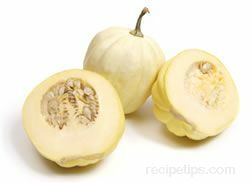 A winter squash whose flesh, when cooked, forms translucent spaghetti-like strands that have a mild flavor. It can be cooked by baking, boiling and steaming. 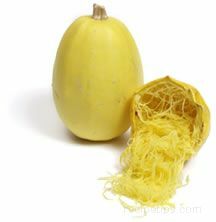 Spaghetti squash is available throughout the year but is best September through February. When selecting, choose those with smooth skins, avoiding those with soft spots. The larger the squash, the thicker the strands. Store squash in a cool dry place and it should keep for a month or more. Spaghetti squash will not keep quite as long as some of the other winter squashes. Stripetti Squash A large oval shaped green and tan colored squash that has a watermelon appearance in shape and color. It is a cross between the Delicata and the Spaghetti squash. A thick outer skin, which is very similar to the Delicata, covers a golden stringy-textured inner flesh, like that of the Spaghetti squash. The squash can be baked or steamed and served as a side dish seasoned with butter, herbs and sauces. It can also be served raw and combined with greens to make a tasty salad. When cooked, it provides a flavor similar to sweet potatoes. If the squash is to be baked, cut the squash in half, cutting down the length of the oblong shape. A small plump squash that is only about four to five inches in diameter. Its skin is generally cream colored or light yellow with green stripes. The sweet dumpling's flesh is starchy and pale yellow in color but has a honey sweet flavor. Sweet dumpling squash are available September through December. When selecting, choose those with green stripes and those that are heavy for their size. Avoid squash with green skin, mottling and soft spots. Store unwrapped in a cool, dry location for up to 10 days. Sweet Mama Squash A winter squash that is a variety of buttercup squash. It has a round, pumpkin shape weighing approximately 3 to 4 pounds. 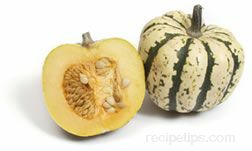 The squash has a bluish-gray to dark green skin covering a thick, fine-grained golden meat that provides a sweet flavor when cooked. It can be baked or microwaved to be served in casseroles or it can be stuffed and eaten on its own as a side dish. A small to medium sized squash with a distinctive crowned top consisting of multiple top knots in white, green and orange colors. The whole squash is often used as a decorative table piece or as a tureen that is filled with squash soup. Firm textured, the inner golden flesh has a delicious hazelnut flavor after being baked or steamed. A pumpkin-like squash that is large and round, easily growing to a size of 15 to 25 pounds at maturity. With a flat-ribbed outer skin that turns orange or bluish-green when ripe, this squash has bright orange meat that is smooth and densely textured. Inside the squash there are numerous large seeds that can be roasted and eaten for a snack. An uncommon variety, the Ukrainian winter squash could be considered to be a sweet meat squash as one that can be eaten raw or shredded raw to be made into slaw salads. When cooked, it has a sweet nutty flavor that goes well with a variety of main dishes. Wash squash under cool running water until all the dirt has been removed. 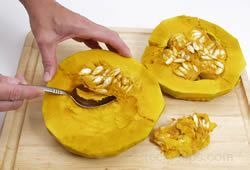 Using a cleaver or large knife, cut the squash in half (lengthwise or crosswise) and remove the seeds and stringy fibers from the cavity with a spoon. Winter squash can be difficult to cut and it is sometimes easier to bake the squash first for 25 or 30 minutes or microwave on high for 5 or 10 minutes and then let it stand for a few minutes before trying to cut it in half. Once the squash is cut in half and seeds removed, it can be quartered, cubed, or sliced if required. Otherwise, cook squash as directed. 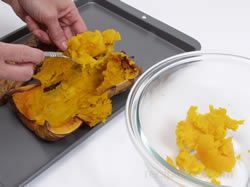 If the squash is going to be cooked whole, be sure to pierce the skin in several places to allow steam to escape and prevent squash from exploding. Large winter squash are sold pre-cut in most supermarkets. For those who have grown large squash in their garden or prefer to buy "fresh", whole squash from the local market, the hard, thick skin of a winter squash poses a major challenge when it comes time to prepare the squash for cooking. An example of a large, thick, bumpy skinned squash is the Hubbard squash. Shown here are two suggested techniques for cutting a large squash into two pieces. 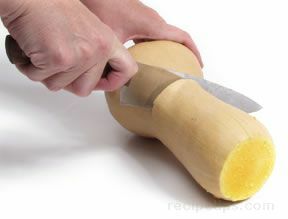 Begin by making a cut in the skin of the large squash to prevent the blade from slipping. Place the blade of a large chef's knife into the shallow cut. 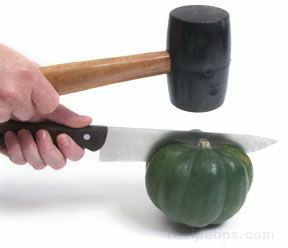 Using a kitchen mallet, begin tapping the blade at the base of the knife until the squash has been cut through. 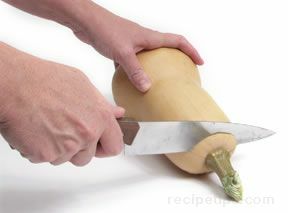 This technique works best when the blade of the knife is large enough to cover the circumference of the squash. If you have grown large squash in the garden and plan on serving them often, purchase a small hand saw to be used solely for this purpose. 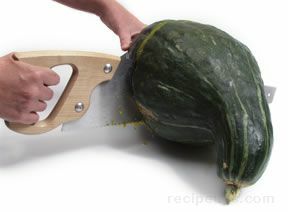 The saw cuts easily through the large squash and leaves behind a clean cut. Using a large spoon or scraping tool, remove the stringy fibers and seeds from the cavity of the squash. Clean seeds and fibers from each half before cooking. Cleaning the seeds and fibers out will leave quite a large cavity in the squash. 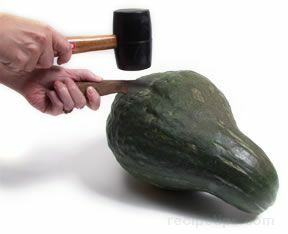 Acorn squash is cut by inserting a chef's knife and tapping with a kitchen mallet. Once the initial cut is made, re-position the mallet to the base of the knife blade and continue to tap until the squash falls into two separate pieces. With a spoon, or scraping tool, remove the strings and seeds. A butternut squash can be prepared in varying ways, depending largely on the way you are going to present it at the meal. The first step of both techniques is to remove the stem with sharp kitchen knife. If you plan to use the squash as a presentation piece, remove closer to the stem, minimizing the amount of flesh removed from the squash. 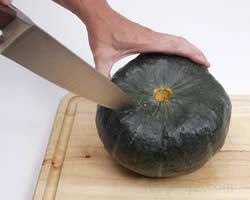 If your intent is to bake the squash and serve it in the skin as a presentation piece, slice the butternut squash directly down the center with a sharp kitchen knife. The strings and seeds are then removed with a spoon or scraping tool. 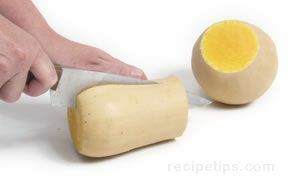 If the butternut squash is cubed, mashed, or puréed, cut the squash into 2 separate pieces before slicing in half. Remove the upper section of the squash. Cut the two sections in half using a sharp knife. Cut each half in the same manner. After each section has been cut in half, remove the stringy fibers and seeds from the cavity of the lower section. Cut halved pieces into smaller pieces if desired. Because of the thick, tough skin, winter squash is typically not peeled. 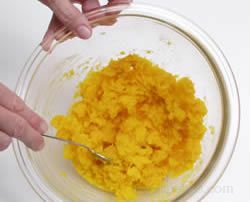 If a recipe calls for squash to be peeled and/or cubed, begin by following the method of partially baking in the microwave. Pierce the skin of the squash with the tip of a sharp knife in several places. This will allow steam to escape and prevent the squash from exploding. Place the whole squash in a microwave safe dish and microwave for 6 to 8 minutes. After microwaving, allow the squash to stand for approximately 10 minutes. 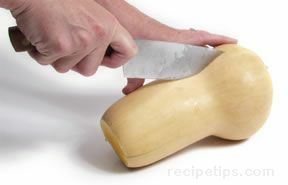 After the squash stands for 10 minutes, begin peeling by cutting the skin off with a sharp knife. Continue to peel around the entire squash until all the skin is removed. 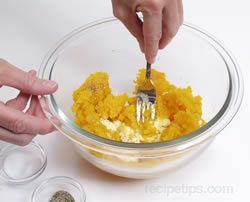 Once the squash is peeled, cut in half and scrape out all the seeds and stringy fibers from the center of the squash. 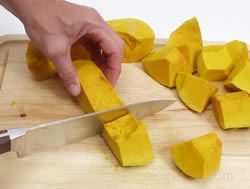 The squash can then be cut into the desired size pieces and cooked until done. The squash can also be cut in half, seeds removed and cut into smaller pieces, before peeling the skin off. Experimenting with both methods will determine which one is preferred. If the squash is to be mashed or puréed, leave the skin on. 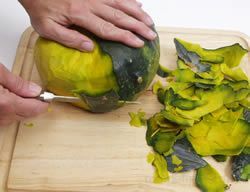 The flesh can be removed by scooping the meat of the squash out with a spoon after it is cook. There are several methods that can be used to cook winter squash. Some of the more common methods are shown below. To boil an uncut, unpeeled squash, pierce the skin in several places with the tip of a sharp knife. Place it in a large pot and add water until squash is covered. Bring water to a boil and continue to cook, covered, at a medium boil for up to 1 hour. The squash is done if tender when poked with a fork. Cut squash into pieces that are approximately 3/4 inch square. Place in a pan with just a little water. Boil for 10 to 15 minutes or just until it is tender. Do not overcook. Boiling is not recommended because of the tendency of the squash to become watery and lose flavor. Steaming is a good method to use for cooking winter squash. Cut squash in half, quarters, slices, or pieces and season as desired. 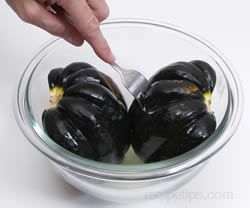 Place squash on steamer rack in a saucepan and cook over boiling water. Cooking time may vary from 15 minutes to an hour, depending on the freshness and type of squash and the size pieces being steamed. 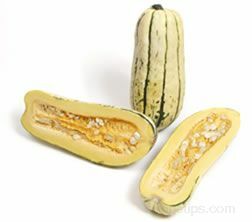 Cut squash in half and remove seeds and stringy fibers as shown above. 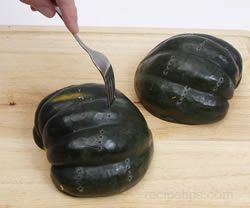 Place squash halves, cut side down in a baking dish or on a cookie sheet. Pierce the skin several times to prevent the squash from exploding while it is baking. Place the squash in an oven preheated to 350°F. Bake for 1 1/2 to 2 hours. Check squash for doneness by poking with a fork in the thickest part of the squash. Squash should be tender when pierced. The longer the squash is baked the more water that will evaporate from the squash, making the squash sweeter in taste. When done, scrape the cooked squash away from the skin and place in a bowl. 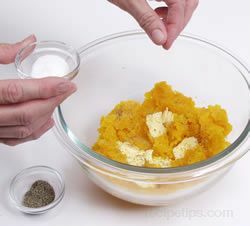 After all the squash is removed from the skin, add 2 to 3 tablespoons of butter and season to taste. The amount of butter will vary according to the size of the squash and personal taste. Mash the squash with a fork until the butter is well blended. If necessary, warm squash in the microwave or place it bake in the oven for a short time so it will be hot when it is served. Instead of mashing the squash it could be left on the skin, cut into wedges and then brushed with melted butter. Then sprinkled with salt, pepper and brown sugar. When cooking squash in the microwave, cooking times will vary according to the strength of the microwave being used. 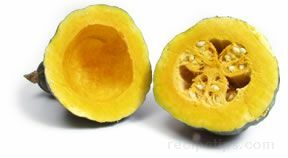 Cut squash in half and remove seeds and stringy fibers as shown above in squash preparation. Pierce the skin in several places on each half to prevent the squash from exploding while it is cooking. 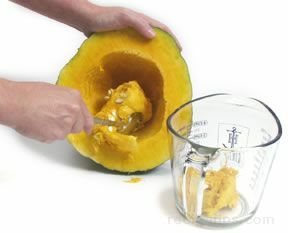 Place the squash in a glass bowl with cut sides facing the sides of the bowl. Cover the bowl with plastic wrap, leaving a vent on one edge for the steam to escape. Place in the microwave and cook on high for 10 to 20 minutes. Poke squash with a fork to check for desired tenderness. If not done, place back in the microwave on high again and cook for an additional 3 to 5 minutes. Check again for doneness. 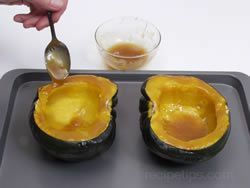 While the squash is cooking, prepare a glaze consisting of 1 1/2 tbsp. of butter, 1 1/2 tbsp. of brown sugar and a pinch of salt. Heat the mixture until the butter and sugar are well combined and it has begun to thicken. Place cooked squash on a cookie sheet with cut side up and drizzle glaze on the edges and in the cavity of the squash halves. Place under the broiler for 5 to 7 minutes until the glaze has caramelized. Cut into smaller serving sizes if necessary and serve while hot. Because of the dense, hard flesh that winter squash has, it is best to partial cook it before grilling. Follow the preparation instructions above for partial cooking and then peeling the squash. Once the squash has been peeled, cut in half and seeded, cut it into 1 1/2 inch pieces. 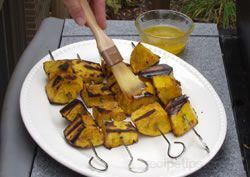 Place the squash pieces on metal skewers and brush with melted butter. Place the squash on the grill over indirect high heat. Cook with the hood down for 15 to 20 minutes, turning once through cooking time. 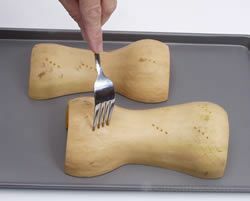 Check squash for doneness by poking with a fork. Squash should be tender when pierced. 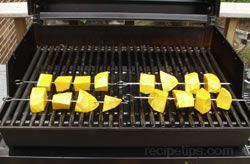 When done, remove squash from the grill and brush with a mixture of 1/4 cup melted butter and 2 tablespoons of honey. Serve while warm. When baking, add butter and brown sugar to the cavity for a sweeter taste. 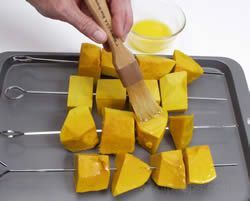 To remove fibers from fibrous squash, whip cooked squash with an electric mixer. The fibers will be caught up in the mixer blades. The skin on the squash will be easier to remove after the squash is cooked. "I love winter squash, but tend to hate the effort of getting into them. Your little hint of cook a little first is worth a try."